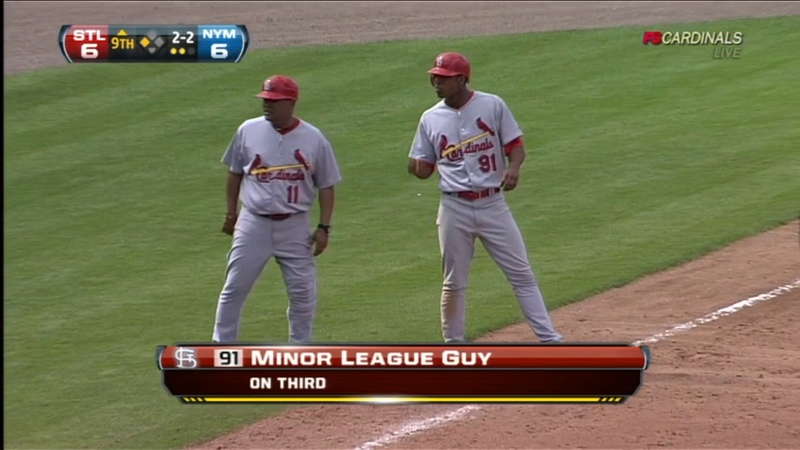 Of course, many of us baseball diehards knew ol’ Minor League Guy to be Oscar Taveras, the team’s second-best prospect according to Baseball Prospectus. Flash forward about a year and the broadcast team shouldn’t have any trouble identifying Taveras in a Grapefruit League game. First of all, he should be in the game well before the ninth inning, but more importantly he is now baseball’s second-best prospect or at least no worse than third-best. He was even labeled properly in this picture with teammate Jon Jay in an article discussing his excellence. Like last year, there is a triumvirate of guys – once again two hitters and a pitcher – and the order will vary from outlet to outlet and person to person. Last year it was Mike Trout, Bryce Harper, and Matt Moore; this year it’s Taveras, Jurickson Profar, and Dylan Bundy. And that is just from the early lists. Baseball Prospectus and Baseball America will have their top 100s out soon and I’d be surprised if they disagreed on the trio. Though it was probably a bummer to get labeled as simply “Minor League Guy” on television, it looks like Taveras will have the last laugh as he now stands atop, or at least nears the top of baseball’s prospect heap. Imagine if he pans out on the Vladimir Guerrero comp that some have thrown on him, maybe he’ll end up being labeled as “Hall of Fame Guy” on a broadcast 20 years down the line. Just over a week ago, I wrote up a bunch of AAA hitting prospects who we could see make an impact throughout the summer and now it is time to take a look at a group of pitchers who could do the same. As with the hitters we have already seen a large group of pitchers come up such as Danny Duffy, Rubby de la Rosa, Juan Nicasio, Brad Hand, Andrew Oliver, Charlie Furbush, Alex Cobb and Alex White. We have also seen Randall Delgado, Mike Minor & Julio Teheran from the Atlanta Braves, but they have bounced back and forth from minors to majors. All three are currently down right now, but since they have already been up, you won’t see them on this list. This list is thinner than the 21 hitters that were discussed, but that actually works out just fine given how plentiful pitching has been this year in the dramatic new pitcher’s era that has carried over (and accelerated) from 2010. Todd Redmond (ATL) – It is just ridiculous how much major league-ready pitching this organization has right now. How often does a 26 year old in AAA with a 2.52 ERA, 1.10 WHIP, 6.9 K/9 and 3.1 K/BB have almost no chance at making it to the majors with his current team? Not very often, but when your parent club runs five deep on their rotation followed by three blue-chip prospects ahead of you, it is tough sledding for big league playing time. Perhaps they will consider moving Redmond in a trade and he will get a shot with a new team. Felix Doubront (BOS) – The backend of the Red Sox rotation is very much unsettled and there is no certainty that recent call-up Andrew Miller will be the savior which could open a chance for Doubront and his strike-per-inning arm. He has a sub-3.00 ERA over his last 117 minor league innings (2.89) combining this year and last with 112 strikeouts. I hope he does get a chance to prove himself as a starter because he can miss bats and induce groundballs at a strong rate; keep the southpaw on your radar. Kyle Weiland (BOS) – Another hard thrower, Weiland also has a strong sinker and has put together a strong debut in AAA striking out nearly 10 per game though control is a bit of an issue (4 BB/9). He has induced a lot of groundballs at every stop including at a 48% clip this year. He profiles a little more like a reliever than Doubront for me mainly because of the control, but there is no denying that Weiland has been one of Pawtucket’s best starters. Duane Below (DET) – The Toledo Mud Hens has a strong rotation earlier this between Below, Furbush and Oliver. Furbush has come up and stabilized the bullpen at the big league level and Oliver got a quick two-start look before returning meaning perhaps Below is next? Phil Coke has hardly been special in his conversion from reliever to starter and while I much prefer Oliver long-term, Below could get a look and perhaps contribute for the rest of 2011 while Oliver continues to work at AAA. Below (25) is two years older than Oliver, but it has been a deliberate ascension through the minors for the lefty. Coming off of 2009 Tommy John Surgery, his strikeouts have tumbled from strikeout-per-inning stuff to a craftier 6.6 K/9 level, but he has improved his control significantly to compensate. I don’t see star potential, but he could come up and be a deep mixed league or AL-Only league asset thanks to a solid, though unspectacular skill set. Mike Montgomery (KC) – The 2011 season has delivered the first bit of real adversity in Montgomery’s career as a pro as he pummeled every level up until AAA with ERAs of 2.61 or better at every level save a 3.47 at AA. He had shown impeccable control and command at every level up until AA, too, when his walk rate pushed 4.0 per game (3.9 in 60 IP) giving him his first sub-2.0 K/BB. Those struggles have amplified and continued at AAA as he has a 5.3 BB/9 and 1.4 K/BB leading to a very ugly 5.83 ERA and 1.55 WHIP. He could turn it around, go on a stretch and be in the majors in a flash which is why he is included on this list, but things haven’t gone exactly according to plan for Montgomery. He looked pretty sharp when I saw him back in April, but that was also his best month by far (2.67 ERA) and yet he wasn’t as crisp as he looked in Arizona Fall League. Pitcher growing pains are nothing new so just be patient if you own him in a league with minor league rosters and prepare for the very real possibility that he doesn’t hit the majors in 2011 or only gets a cup of coffee in September. Kyle Gibson (MIN) – Hey, a groundball-heavy strikethrower, how original Minnesota. Gibson pounds the zone as those in the Twins organization are wont to do and his slider and changeup not only induce plenty of weak on the ground contact (55% GB rate this year; 54%+ at all four stops as a pro), but also generate a lot of swings & misses allowing him to pile up enough strikeouts for a 9.4 K/9 in 76 innings at AAA. He might be what I wish Scott Baker and Kevin Slowey were all these years which is a combination of the best parts of themselves (pinpoint control, above average strikeout rates) and Carl Pavano essentially trading their fatal flaw of a flyball lean (which leads to gopheritis) for Pavano’s primary asset: a near-50% groundball rate. I couldn’t believe he didn’t get a call up when they were floundering, but now their resurgence has been starting pitcher driven which could keep him down until late July, if not later. I continue to have zero confidence in Nick Blackburn though there isn’t a shortage of smoke or mirrors in the United States so he might be fine, but Brian Duensing is better as a reliever and Gibson really should already have his spot at this point. I would keep a close eye on Gibson’s progress and Minnesota’s transaction log because I think he could make an instant impact. David Phelps (NYY) – Phelps has 156 strong innings at AAA the last two years yielding a 3.7 K/BB so I’m not sure why they even wasted their time with Brian Gordon, who had the impressive debut, but got obliterated on Wednesday in Cincinnati. He is a 32-year old journeyman reliever and they are in the midst of a pennant race so Phelps or the next guy on this list, both college arms, probably should have gotten the nod there. But that has passed. The fact is that the 60% of their rotation is a question mark and you could make a case for as much as 80% given how unreliable AJ Burnett is start to start. How much can Bartolo Colon deliver when he gets back from injury? They can’t patchwork the entire rotation with rookies and so they will probably make a trade or two, but Phelps should get a chance at some point this year, especially if Phil Hughes doesn’t show marked improvement when he returns after two more rehab starts. Adam Warren (NYY) – You can essentially re-read the above and fill in Warren for Phelps while tamping down the expectations a few notches as Warren hasn’t quite been as impressive. He has just a 5.7 K/9 and 1.6 K/BB so don’t let his better ERA (3.07 to 3.38) fool you. Still, Warren is a higher rated prospect within the org and minor league numbers don’t always tell the whole story so you will need to keep a close eye on the situation to know who is leading if/when another chance for promotion comes up. Neil Ramirez (TEX) – How unexpected is Ramirez’s season? He came in as the 27th ranked prospect in the org according to Baseball America and he was slated to start the season at High-A. He did and in his only start there he struck out nine in 4.7 innings allowing just a hit and zero runs. The AAA club needed an arm five days later so he got what was supposed to be a spot start. After throwing six shutout innings against the blue chip-laden Kansas City Royals AAA affiliate allowing just three hits with five strikeouts and zero walks, the decision was made to keep him at AAA. He hasn’t disappointed at all striking out 10 batters per game in his 62 innings and maintaining a strong 2.4 K/BB (the walk rate is a little high at 4.1) en route to a 3.65 ERA and 1.33 WHIP. He has unquestionably been the best starter for the AAA team, but whether that means he will get the call at some point this year remains to be seen. He isn’t without flaws. Though he can pile up the strikeouts, the walks are an issue as I mentioned and he has a heavy flyball lean (never more than 40% GB at any level including 38% this year) which could be problematic in Arlington during the middle of the summer. The way he has responded to being thrust into AAA this year makes me like his long-term prospects, but in the short-term he could be Derek Holland-esque with some tantalizing starts as well as some flameouts. He is far from the Rangers’ best pitching prospect, too, which tells you how well they are set up going forward. Brad Mills (TOR) – He was in the midst of a great season showing that perhaps it wasn’t so hard to pitch in the PCL with a 2.86 ERA in 85 innings halfway through June. He has hit one helluva rough patch the last two outings combining for just 11 innings allowing 13 runs (11 earned) thanks in large part to four home runs pushing his season ERA to 3.57 in an 11 day span. His skills still remain quite strong though with an 8.1 strikeout rate, 2.3 walk rate and 3.6 K/BB rate in 96 innings of work. Yet somehow Zach Stewart leapfrogged him from AA to replace Kyle Drabek in the rotation. With only Ricky Romero pitching anywhere near expectations, Mills should get another shot (he has 30 MLB IP over the last two years) at some point this summer. He picked a nice time to finally have a breakout season in the minors and tame AAA hitters after two unsuccessful tries in 2009 and 2010. Tom Milone (WAS) – Speaking of breakout seasons, this mid-tier organizational prospect has exploded at the AAA level enhancing his already brilliant control while amping up his strikeouts a bit to post a Cliff Leeian 16.4 K/BB rate in 76 innings (Lee was at 16.3 after 139 innings last year, but a late summer swoon pushed him all the way down to 10.3, 2nd-best in MLB history). Milone was quite impressive last year at AA, but he has taken it to another level this year allowing as many homeruns as he has walks (5 apiece). He doesn’t have overpowering swing & miss stuff so it would be a minor miracle for him to post anything near a strikeout per inning at the big league level, but he can no doubt be a backend of the rotation asset as a control artist who spins a gem every once in a while. We have seen several guys with this kind of profile do some good things in the majors, especially this year with offense down so much. I think he can be a John Lannan-plus trading some of Lannan’s big groundball rate for a strikeout rate better than Lannan’s nearly unusable sub-5.0 marks of the last three years. I hope Milone gets a call soon as I am eager to see what he can do in the majors and how much of his gaudy statistical profile will come with him. They are really putting something together in Washington. It’s not always *only* about the blue-chippers as you need glue guys like Milone. After I posted the Keeper League Building Blocks for second base a reader mentioned a couple of names to me on Twitter that were to surprise exclusions for the reader: Dustin Ackley & Jemile Weeks. The freshly called up prospects without 20 games between the two of them (17, 14 of which are Weeks’) weren’t included on purpose. Anyone who has been reading this site for any amount of time since last year knows I am fan of both, so what gives? A large portion of it has to do with their scant track records as we haven’t really seen how they will handle the majors leagues. While I am bullish on both, I would certainly like to see more before recommending them as building blocks for a team. Building block is the key phrase. The point of this exercise is to identify the strongest and best players for your 2012 title run. After all, you are trading your best 2011 pieces to your opponents so you need to get the best return possible. Additionally, the fantasy profiles of each also contributes to their exclusion from a list that focuses so much on key contributors. Ackley is supposed to be an on-base percentage monster (alas he’s yet to walk in his four games… so much for that, amirite??? ), but if you don’t play in an OBP league that hardly helps especially since he can have a great OBP based on walks with a batting average of .275 or below. Let’s assume he does get on base at or near the 40% clip we’ve seen from him in his minor league career, who is going to drive him in? They are less awful than last year’s historic futility, but they are still awful. Beyond that, in the short-term he doesn’t profile to excel in any category whether as a pure hitter (batting average), a power producer (HR, RBI) or as a speedster (though he did get a 65 speed grade from Baseball America in their ’11 Handbook). I think he can eventually become a .300+ hitter, but I don’t see it happening right away. I really like Weeks, but like his brother Rickie he needs to show he can stay healthy which is something he has yet to do for a full season as a professional. Initially he profiles as a speedster who could pile up SBs and use that speed for some extra hits en route to a good enough batting average (.260-.270). Long-term his peak profile is a Ray Durham, but Durham didn’t start offering meaningful power or top .275 until his fourth year in the league. The progression of youngsters isn’t linear so as hard as it is to project any player, it is even harder to project where Ackley & Weeks will go in 2012 and ultimately that is why I decided not to recommend them as essential building blocks for teams currently selling off their best players for foundational pieces. If you have a deal lined up to get a building block, try to get one of these two thrown in, but don’t make them the centerpiece focus of a deal where you are trading your ace or $35 power bat. The turning of the calendar to June brings about the crossing of the nebulous Super 2 deadline that often keeps big time minor league prospects down a little longer than their talent necessitates. As such we have seen an influx of prospects recently including names like Mike Moustakas, Anthony Rizzo, Dee Gordon and Jemile Weeks. They join a host of blue chip youngsters already up including but not limited to Moustakas teammates Eric Hosmer and Danny Duffy as well as Gordon teammate Rubby de la Rosa. Though several highly anticipated players are up, “prospect season” is really just getting going and there are a lot of potentially high-impact players who could be called up in the coming weeks to help plug the holes of a fantasy team near you. Depending on league format and roster size, you may want to roster some of these guys, trade for them or merely put them on a watch list and hope to anticipate their call-up just right to acquire them at the lowest price possible. Some of them are further away, but you can never predict injuries so it is best to know these names for the summer. First off, we will look at AAA hitters which offers 21 (and a half) names to keep an eye on. Collin Cowgill (ARI, OF) – A mid-tier prospect within the D’Backs organization pegged as a 4th OF-type, Cowgill is embarrassing pitchers during his first tour of AAA. He has been strong all year, but it is his white-hot start in June that is garnering attention: .524/.565/.857 w/8 XBH, 2 HR, 9 RBI, 3 SB and 13 R in 42 AB at AAA-Reno. He may well be a product of the environment, but a .372 AVG and 1.053 OPS with 19 SB (in 21 tries) are impressive anywhere. Honorable Mention goes to teammate in Reno, Wily Mo Pena. He’s the “half” as he is no longer a prospect at 29, but he is a longtime favorite of mine and his .341 AVG, 1.106 OPS and 18 HR could earn a trip back to majors soon so I wanted to include him. Gerardo Parra is playing some great D in left, but they might trade the D for a bat like that. Lonnie Chisenhall (CLE, 3B) – Cord Phelps was called up to platoon with Orlando Cabrera, who can’t hit righties at this point and it is time to do the same with Chis and Jack Hannahan. Unlike Phelps, Chisenhall has a sharp platoon that marries perfectly with Hannahan’s. Chisenhall’s inability to hit southpaws shouldn’t keep him in the minors when a major league solution is so readily available, especially as Cleveland’s grasp on the division continues to rapidly slip away. Jason Kipnis (CLE, 2B) – Another strong Indians prospects who continues to impress at every stop along the minor league trail. His .830 OPS in 58 AAA games is his lowest mark at any level in three years a professional. While it is great that the Indians are flush with major league ready prospects, it is unfortunate that none of them are on the pitching side which was always going to be the downfall of this hot start. Yonder Alonso (CIN, LF) – I still think a trade is the best move for him as I don’t see how he deserves a shot in Cincinnati’s leftfield as an unproven prospect when Chris Heisey is already performing well above average and should be handed the job regularly. All the talk of how mangled Cincy’s leftfield is boggles my mind as Heisey should play against righties and Jonny Gomes against lefties. Problem solved. Alonso, meanwhile, should be traded to shore up other areas on the team (pitching). If he is dealt, there is little doubt that the trading team would bring him up immediately. He has proven all he can in AAA with an .853 OPS in 159 games. Zack Cozart (CIN, SS) – I’m not sure there is a level of excellence with the glove that Paul Janish could realistically reach, even at shortstop, to merit putting his bat in the lineup on most nights. He has a 44 OPS+. 44!!! Not only that, but Cozart has a strong glove so it’s not even a major hit. He’s in the midst of his best season as a pro (.328 AVG, .870 OPS) and seemingly cannot be worse than Janish at this dish so a call has to be imminent, right? Juan Francisco (CIN, 3B) – He’s not really a prospect at this point because he has been up each of the last three seasons including for nine games already this year, but all three samples are tiny (a high of 55 AB) so we haven’t really seen what he can do. He has big time power potential, but he’s also very impatient and with Scott Rolen healthy, lacks a place to play. Devin Mesoraco (CIN, C) – He’s also blocked at the big league level, but it’s by a 35 and 30 year old tandem so neither is the long-term solution and perhaps a trade of one could be imminent (to San Francisco perhaps?) opening the door to usher in the Mesoraco era slowly. His prospect status was dimming before an explosive 2010 season that landed him 64th on Baseball America’s Top 100 list this preseason. He has backed it up with a .330/.412/.569 line with 8 HR and 30 XBH (out of 65 total) in 197 at-bats. Needs a trade (of one of the incumbents) or an injury, so he’s more of a wait-&-see unless you have a minor league roster in your league. Clint Robinson (KC, DH) – The biggest problem with Robinson is right there next to this team in the those parentheses back there. He’s already a DH. That is a bit of a problem on just about any team, but apart from being locked behind David Ortiz on Boston or whichever of the two catchers in Detroit is DH’ing, he is on the worst possible team to be a DH-only player. His former AAA teammate, Eric Hosmer, has gone up and grabbed the first base job in KC, but that squeezed incumbent Billy Butler to DH leaving nowhere for last year’s Texas League Triple Crown winner to go. He isn’t quite winning the PCL Triple Crown, but his .349 batting average, 17 home runs and 50 RBIs are all near the top of all three categories. He has maintained a steady 17-18% strikeout rate in his five years as a pro and he has improved BB/K each (save a dip to .44 in 2009) year from 0.45 in his first year to 0.79 this year. Despite his giant season last year and a big start to this year, he is still seen as a middling prospect at best. Trayvon Robinson (LAD, OF) – Robinson is a perfect example of why you have to be careful with Pacific Coast League numbers. He has already far exceeded his 2010 home run total of nine by clubbing 13 in the very hitter-friendly confines of Albuquerque. He has a particularly odd split so far this year hitting to a 1.224 OPS in day games, but just .791 at night. His speed is the more bankable asset in his arsenal as the power exists, but at a more modest level than his .538 SLG so far this year suggests. His patience seems to have regressed significantly this year, too. After a four year rise up to 0.58 BB/K last year (up from 0.27 in 2007), he’s back down to 0.26 this year. Mat Gamel (MIL, OF) – The former 34th ranked prospect (2009) has become something of an afterthought having failed to top 96 games played in each of the past two years, but still just 25 he remains a huge power threat with an excellent hit tool (.303/.374/.522 w/11 HR in 228 AB this year). The problem is that he might be a 25-year old DH. Thought to be a Ryan Braun-lite based on his prodigious power and lack of defensive ability, the places where he could be hidden on the diamond are already taken, including one spot by Braun. Thus his big league future with the Brewers remains cloudy. Keep him on your radar. Caleb Gindl (MIL, OF) – I liked what I saw out of him in the Arizona Fall League, although the three game sample was tiny, but the smallish (5’9”) Gindl packs a punch, especially against righties (.838 OPS; .917 v. RHP including all 6 of his HR). He could feasibly play any of the three OF positions without embarrassing himself, but there isn’t a natural opening anywhere on the big league team with two big bats at the corners and Carlos Gomez’s exemplary glove essentially being his only value-add. At 23, there is no rush so he might not get a shot until late this summer, if at all in ’11. Kirk Nieuwenhuis (NYM, OF) – Probably more of a 4th OF long-term, Nieuwenhuis could get a shot sooner than later as he performs well at AAA (.298/.403/.505; best season as a pro so far) and Jason Bay struggles to hit his weight (.208 v. 210 lbs.). Lucas Duda was first in line as he already has MLB experience and he’s up now, but if he doesn’t better his .611 OPS in 108 career AB, Nieuwenhuis should get a look. He does a little of everything a la someone like Chris Denorfia. Jesus Montero (NYY, C) – He’s gotten worse month-to-month in his second tour of AAA and some have suggested that perhaps he is bored a la Hanley Ramirez back in 2005 during his second go-round in AA in the Boston system. Montero is hitting a decent .289, but there has been no patience and remarkably underwhelming power. I would still keep a close eye on him because of the Hanley note. I wouldn’t be surprised if he got the call to catch a bit and/or DH and then ended up catching fire right away. Michael Taylor (OAK, OF) – Remember him? The former top 30 prospect took himself off the radar with a rough 2010 season, his first full one in AAA. Injuries exacerbated things, but he just couldn’t get right at the plate. He missed April, but he’s back now and having a bit of a resurgence with a .297/.360/.440 line in 91 AB so far. It wouldn’t take much for him to be an improvement over some of the outfield bats in Oakland so if he sustains himself, he could be up shortly after the All-Star break. Adrian Cardenas (OAK, IF/OF) – The long-time infielder has become more an outfielder/DH-type in 2011 which definitely cuts into his value, but he is having his best season with the bat and that is all Oakland really needs to hear to be interested. Plus with Jemile Weeks finally called up and Scott Sizemore traded over from Detroit, second and third base might finally have solutions that can push .700 OPS (which would be light years ahead of Mark Ellis’ .533 and Kevin Kouzmanoff .615 marks). Cardenas has always been a .300ish hitter with a great batting eye and that has continued this year with a .329 average and 25 walks against just 20 strikeouts. Hideki Matusi and David DeJesus are severely underperforming so Cardenas, still just 23 years old, could get a shot. Dustin Ackley (SEA, 2B) – Ackley hates the month of April. Not sure if there was some awful girl named April that wrong him or what, but he has hit .182 in 170 at-bats during April of his first two professional seasons. In all other months, he is hitting a combined .305 in 594 at-bats. I saw Ackley during Arizona Fall League in November and I was thoroughly impressed with his awesomeness, but a lot of outlets don’t see him as a high-impact hitter. I’m not a professional scout and it was a small sample, but he looked great. He could hit to all fields, had enough pop (mid-teens home run power, but a crapton of doubles) and of course absurd on-base percentage thanks to a tremendous eye. I don’t care how good Jack Wilson’s defense is, he has a .528 OPS and Ackley should be playing second base for the Mariners, especially since they are in sorta-contention with their pitching staff. Alex Liddi (SEA, 3B) – Liddi is a good example of why you can’t also focus solely on the numbers of a minor leaguer. Context is so important. He’s a 22-year old at AAA, which isn’t Jesus Montero-young, but still pretty young and he is holding his own. He is having his best power season since his 2009 Cal League MVP, but his 34% strikeout rate is a career-high and would be problematic at the big league level. He is an AL-Only pickup initially if he gets the call, but he has significant potential. They did make a significant investment in Chone Figgins and it is hard to replace him because of the contract, but at some point a team cannot eat a .190 average and .494 OPS especially if you want to be a contender. Thomas Neal (SF, OF) – It is merely an alphabetical coincidence that these last five players are all in offensively-starved organizations and Neal could benefit from the Brandon Belt injury. Pat Burrell and Aaron Rowand aren’t impressing at all with the bat in left and the former is terrible with the glove. Neal has shown power before, but it went from home run to doubles power last year and has been the same this year. He isn’t a *special* prospect, but that doesn’t mean he can’t have plenty of value as an everyday player who can give something across the board. Think Martin Prado from last year (.307, 15 HR, 5 SB, R & RBI depending on lineup spot) with a lower batting average until he establishes himself at the bigs. Desmond Jennings (TB, OF) – OK, Tampa Bay, enough with Sam Fuld. It was a fun 15 minutes, but now it is time to get your best hitting prospect on the field and contributing to your lineup. Jennings languished a bit last year in his first AAA stint dealing with nagging injuries for most of the year, but this is another example of not basing everything purely on the numbers because despite a .756 OPS Jennings was still doing a lot of stuff well last year. He looks great so far in 2011 already popping three times as many home runs (9) as all of last year with a healthy wrist, getting on base a ton and displaying his absurd elite-level speed. His strikeouts have ticked up to a career high 18%, but his walk rate has matched his career mark of 11%. He is likely owned in most leagues with a bench, but on the off-chance that he isn’t go get him now. Brett Lawrie (TOR, 2B/3B) – Similar to Belt in San Francisco, Lawrie had fantasy owners salivating at the possibilities of what he could do at the major league level and then he got hit in the hand with a pitch. Now Belt was already in the majors, but Lawrie was set to come up within the next day or two when it happened. Originally they thought he would avoid the disabled list, but he hit the minor league DL just over a week ago. He should come to the majors almost immediately after his activation and then everyone can resume drooling. I am cautiously optimistic about his potential, as he delivers across the board talent with a .354 batting average, 15 home runs and 11 stolen bases. But it was in the remarkably hitter-friendly environment of Las Vegas and the PCL and then of course he is still just 21 years old. He isn’t a guarantee to come up and Ryan Braun the big leagues. So temper your expectations and the price you are willing to pay to roster him. Remember, everyone went nuts over Jason Heyward (with good reason as he appears to be a star in the making), but he needed 142 games to hit 18 home runs and steal 11 bases and no one had Lawrie as a better prospect. Matt Antonelli (WAS, IF) – Remember him? This one-time top 50 prospect started with San Diego making his major league debut at 23 years old back in 2008. Coming into 2008 he was seen as a 5-star prospect by Baseball Prospectus’ Kevin Goldstein thanks to a great 2007 (.307/.404/.491), but that year the wheels came off as he posted a .657 OPS at AAA before playing just 60 games over the next two years missing all but one last year thanks in large part to a hand injury. Now 26, he has battled back and he has been raking in his first 22 games at AAA in the Washington organization. He has a .358/.422/.531 line with two home runs (eight extra base hits in all), two stolen bases, six runs scored and seven driven in. His strong batting eye appears to be intact as he has drawn nine walks against 12 strikeouts. The only downside in this comeback story is that the three infield positions he plays are all blocked by cornerstone pieces of the future in Ryan Zimmerman, Ian Desmond and Danny Espinosa. The latter two are struggling a bit in various areas of their game, but at 25 and 24 years old, respectively, they are going to be given a chance as the Nats aren’t going anywhere. In that 2008 write-up of Antonelli, Goldstein mentioned he was going to get reps in the outfield that Spring Training mostly to see if that would be a fit for the future. Well it’s the future and that could be avenue to explore to get his bat in the lineup if he reaches the big leagues in the near future. Of course Laynce Nix is raking (against righties) and Jayson Werth isn’t going anywhere so maybe a trade is truly the best chance. Earlier this week I discussed the Oakland A’s and why they ought to consider moving Andrew Bailey if and when he comes back healthy and pitches like we are used to seeing. They are at .500, just a game out of first powered almost exclusively by their great pitching, both starters and relievers. Moving Bailey for the right bat would be an excellent upgrade to their lineup, but the 23rd-ranked offense (by runs) needs more than one move to make them a legitimate contender. I mentioned that another move can be made from within the organization and I was referring specifically to second base prospect Jemile Weeks, brother of Rickie Weeks. The 2008 first round pick out of the University of Miami has really struggled to stay healthy as a pro which has slowed his progress a bit, but he has been healthy so far this year showing why he was a first round pick and leading to his best season yet 29 games in. Hip and leg issues have limited to just 77 and 80 games in his two full seasons as a professional. When he is on the field, he shows an all-around game including speed, discipline, a quick bat and more power than you would expect from someone who is 5’9 and 160 pounds. His stolen base numbers don’t suggest massive speed, but that is certainly tied to the hip and leg issues. His ceiling doesn’t quite have the near-30 home run power like his brother, but in exchange for that he shouldn’t have the same strikeout issues that does Rickie does which often drain his batting average. Badler and colleagues compared Weeks to Ray Durham in this year’s handbook and Durham was a mid-teens home run hitter and a career .277 hitter so that fits the trade of power for batting average as compared to Rickie. It’s only 29 games of elite production, but it’s health not talent with him so there shouldn’t be a fear that the bottom will fall out on his stat line. He wouldn’t even need to be playing this well to merit a call up when you consider the “production” the A’s are getting at second base right now. Mark Ellis has a gawd-awful .204/.229/.279(!!!) line in 147 at-bats with no home runs, 11 RBIs and 4 stolen bases. He has had some pretty decent years in the past and he was never at risk of losing his job because he was an elite defender. Maybe he is hiding an injury because he looks completely lost at the dish. If you have an open bench spot, I would definitely speculate on Weeks in an AL-Only league and possibly in deeper mixed leagues if I really needed a middle infield boost in my lineup. The A’s certainly do so they shouldn’t hold Weeks back too much longer as they are clearly contenders in that AL West with their ridiculous pitching. A lot of times these call ups happen without warning so if you grab him early, he will be very cheap which is also good insurance because if it doesn’t work out for some reason then you can cut him with minimal damage to your FAAB budget. Carlos Pena is in the midst of one of his famous Pena Power Pushes with five home runs in his last 12 games. He has a .368/.490/.789 line during the stretch with 9 R, 11 RBI and 10 BB. I’m sure many of his fantasy league owners didn’t get all of or any of this stretch as they were frustrated by the .157/.286/.171 line prior to the run. Of course if you know anything about Pena then you know you have to sit through these kind of slumps so if you draft him then the onus is on you to practice extreme levels of patience. Since emerging as a prolific and consistent power hitter in 2007, he has been possibly the streakiest home run hitter in the game. The 21-game homer-less streak he started this season with is his longest since his rise to prominence, but it was also injury-related as he was dealing with a thumb injury so that only compounded things for a guy who is naturally inconsistent. Morale of the story: if you are willing to take the risk of drafting him, set it and forget it. Secondary morale: NEVER draft him in a H2H week. He will kill you three weeks at a time before finally winning one by himself. Carl Crawford is hitting .290 in 62 May at-bats notching a hit in 13 of his 15 games. There hasn’t really been much else yet (2 SB, 4 RBI, 7 R), but considering the fact that he hit .155 for entire month of April his owners will take any glimmer of hope that their first round (or second round at latest) pick is ready to perform like one. Drew Stubbs has reached base in his last 10 games posting a very strong .349/.440/.535 with 2 HR, 4 RBI, 4 SB, 7 BB and 9 R in 43 at-bats. He was a target sleeper for many, namely Matthew Berry of ESPN and Cory Schwartz of MLB.com, being tabbed as potentially this year’s Carlos Gonzalez. So far he has lived up to the billing pacing for a season of .279 batting average with 27 home runs, 77 RBIs, 123 runs scored and 54 stolen bases which would no doubt make him one of the best fantasy players in all of baseball. He is currently rated 5th on ESPN’s Player Rater and checks in 8th overall in Yahoo!’s ranking. Before hitting the disabled list with an injury, Victor Martinez had a .250/.292/.417 line and hadn’t hit a home run in 12 games as the Tigers were an underwhelming 8-9. He has torched the place since coming back from injury hitting .415/.489/.683 with 7 XBH (including 2 HR), 14 RBI, 9 R and 6 BB in 41 at-bats. His surge places him 3rd among catchers on ESPN’s Player Rater behind teammate Alex Avila. Martin Prado has reached base in 20 straight games dating back to April 26th including hits in 19 of them. He was hitting .240 before the run, but going .360/.394/.551 w/4 HR, 17 RBI, 13 R, 5 BB, 3 CS in 89 AB has brought him to .296/.338/.450 which is just a tick below his career marks while his 117 OPS+ is right in line with his career 116 given the down hitting environment of 2011. Perhaps Alberto Callaspo is the oasis you are looking for in the third base wasteland. It was pretty weak before the season started and a rash of injuries might have taken it past shortstop as the worst fantasy position on the diamond. He is available in a lot of leagues, too: CBS: 60%, ESPN: 49%, Y! : 32%. In his last 12 games he is hitting .391/.404/.522 w/11 RBI. Only 2 R and 0 HR & 0 SB, but again, it’s awful at third base so beggars can’t be choosy. He is hitting .309 on the season and on pace for 75 RBI. Adrian Gonzalez is positively destroying the competition in his last 10 games to the tune of a .386/.429/.932(!) line with 7 HR, 16 RBI and 12 R in 44 at-bats. He was hitting .250 exactly a month ago; he is hitting .327 now. Rajai Davis has surged since returning from injury with 10 stolen bases and 10 runs scored in 15 games. Mike Trout is living up to the prospect hype following his 2010 breakout, especially in his last 10 games: .357/.417/.643 with 2 HR, 5 RBI, 7 R, 2 SB, 5 BB in 42 AB. Of course, he has been raking all year long hitting .315/.400/.569 with 6 HR, 17 XBH, 17 RBI, 17 BB so he is almost making it difficult on himself to have a stretch that actually stands out. The Kansas City Royals have already called up two of their best prospects in Eric Hosmer and Danny Duffy, who makes his major league debut on Wednesday night. Could Mike Moustakas be next? There isn’t quite the natural opening that there was for both Hosmer and Duffy as Mike Aviles is playing well and even if you were to suggest moving him to second base, they still have Wilson Betemit. That hasn’t stopped Mous from letting his bat make a bid for a call up as he has posted a .394/.474/.909 line in his last nine games with 9 XBH (4 HR), 12 RBI, 10 R, 1 SB, 5 BB and just 3 K (24 in his other 26 games) in 33 at-bats. Man, perhaps even Dayton Moore can’t mess this up. What a ridiculous crop of talent. Dustin Ackley is also making a strong bid to get called up, but unlike with Moustakas in KC, the Mariners can definitely use his bat… and how. Ackley is white-hot in his last 10 going .463/.540/.707 with 2 HR, 8 RBI, 10 R, 8 BB, 5 K in 41 AB. During the streak he has one 0-fer and seven multi-hit games. His season line is now up to .280/.399(!)/.445. He has 33 walks against just 25 strikeouts. Given their anemic offense and his brilliant control of the strike zone, it might be time to speculate on Ackley in leagues where he is available and would be useful (this wouldn’t include 10 team mixed leagues) such as any AL-Only league and deeper mixed leagues with a bench. I would definitely speculate in any OBP league that fits these size criteria because at the very least he will draw walks as soon as he reaches the bigs. Next time, I will look at some pitchers in the midst of a hot streaks. His appointment as acting dean put him in the catbird seat. A team that is just a game over .500, one game out of first place and in third place in their division isn’t often said to be in the catbird seat, but you could make a case that the Oakland A’s are in fact there. The A’s have the best pitching in all of baseball when measured by ERA (2.75) and the best in the AL when measured by FIP (3.19) and xFIP (3.49). Their bullpen ranks very well, too, checking in third and fifth in baseball by ERA and FIP and tied for 14th in xFIP. The best part about their pitching is that they have the 2nd-most innings pitched in baseball, but their bullpen has the second fewest (by a third of an inning to Philly). Their advantageous situation comes in the fact that they are succeeding this much despite their ace closer, Andrew Bailey, not having logged a single inning this year. In fact the fill-in closer, Brian Fuentes, has been one of their worst relievers to date (4.19 ERA, modest 7.0 K/9). Their bullpen is in for significant improvement when Bailey returns which is expected at the end of May. He slots in at closer and everyone else moves down a peg (or out in Craig Breslow‘s case as he is the worst reliever to date statistically speaking). But what if he doesn’t return? Bailey has hardly been the bastion of health during his three year career and while the results when in have been excellent, he has three different DL stints for three different parts of his body (back, right elbow, right forearm) making him a constant risk. The prospect of using Fuentes as their closer for the whole season is probably unsettling for the Athletics’ brass. He has a history of home run issues which is about the worst thing for a closer. He has avoided them this year with a 0.5 HR/9, but that’s thanks to a 3.3% HR/FB rate which is highly unlikely to stick considering he has a 55% flyball rate. The home ballpark definitely masks some of it, but I doubt the park will cover him ALL year. He has already notched three losses, a blown save-win and an ugly save where he allowed two hits and a run (a Dirty Fuentes if you will–full credit to Matthew Berry and Nate Ravitz of ESPN). And that is with just the one home run on his record. As that HR/FB rate regresses to the mean, it could get really dirty. Enter the catbird seat. Their AAA closer in Sacramento is a name you might be familiar with, Joey Devine. He makes Bailey look like Cal Ripken Jr. with an injury track record longer than Paris Hilton’s STD test results. But he is healthy right now and mowing down the competition with 12 shutout innings during which he has struck out 17, walked one and allowed just four hits notching three saves and three wins. If you will recall, the last time he pitched in the majors was 2008 for the A’s and he was excellent in 45.7 innings. He had a miniscule 0.59 ERA, microscopic 0.83 WHIP and elite-level 3.3 K/BB rate powered by his 9.7 K/9. He is a major talent who could definitely wrest the closer’s role away from Fuentes should Bailey miss more time than expected. Or his & Bailey’s health and performance could facilitate a trade for the A’s to shore up their woeful lineup. It is unlikely that they could flip Devine for a game-changing piece, but a healthy Bailey (who is only signed through 2011 according to Cots combined with the fact that the Billy Beane brass has never been tied singling out a closer and making him the unquestioned guy in the role) could probably net a useful bat especially as several wannabe contenders have a hole (or five) in their bullpen (Reds, Angels, Cardinals, Rockies, Brewers, both Sox, Rangers, Dodgers and Tigers all rate 16th or worse in bullpen ERA). And six of those teams (Cardinals, Reds, Yankees, Rangers, Tigers, Red Sox) are among the top 10 in runs scored adding to the potential for a trade fit. The Reds look like a strong fit because they have an aging (36) closer in Francisco Cordero whose strikeout rate is dwindling rapidly (12.2 K/9 in 2007 down every year to 6.1 this year) and their heir apparent, Aroldis Chapman, would walk Vladimir Guerrero… repeatedly. Couple that with their abundance of bats with no place to play, namely Chris Heisey, and trading seems to fit. In addition to Heisey, the Reds also have Fred Lewis and Jonny Gomes (though he is a platoon player on the short end as righties kill him) at the major league level. But if they wanted to keep Heisey and the A’s had no interest in Lewis or Gomes (which would be smart), their AAA team has two strong candidates the A’s would be wise to covet: Yonder Alonso and Juan Francisco. Alonso is a first baseman they are trying at left field simply because he is blocked by the reigning MVP Joey Votto, but their best deployment of him is probably in a trade. He is carrying a .331 average .916 OPS in 130 at-bats for AAA-Louisville and for his career he has nearly 600 plate appearances of .848 OPS at AAA suggesting he is ready for . I appreciate Daric Barton’s ability to take a walk as much as the next guy, but a team can’t compete with a .293 SLG out of their first baseman. That’s so disgustingly bad that I’m sure 64% of you will go check his stats just to make sure it’s not a misprint. The A’s could keep Alonso in the outfield, but that would put him in Josh Willingham’s spot or require moving Willingham to rightfield. You can’t take his bat out of the lineup, though, because his .405 SLG actually qualifies as a power bat in the Oakland lineup. I guess they could put Alonso in left and then Willingham in for Barton (Willingham has played 3 games at 1B. Letting him learn on the fly would still be better than having to suffer Barton’s bat even though Barton is a plus defender), but that would only be an option if they decided that Alonso was a major value-add in left. I can’t speak to his defense in the outfield at all. Francisco is primarily a third baseman which just so happens to be another power position from which the A’s are getting ZERO power. Kevin Kouzmanoff has an OPS (.591) that you would like to see as a SLG from one of (if not more) of your power positions of 1B, 3B, LF and RF. His .351 SLG would make a nice OBP for crying out loud. Francisco is a 24-year old top 10 prospect in their organization from whom big things are expected, but even the .295/.356/.400 production from his 59-game sample in the majors the last three years would be better than anything Kouz can deliver at this point. The Reds also have a multi-positional Todd Frazier in the midst of a breakout at age 25 on their AAA team so the options run deep. With as many holes as they have in their lineup, a singular trade won’t completely turn around Oakland’s offense, but it would be a big step in the right direction. Plus they are doing pretty well overall despite their scrub lineup so maybe one bat would make a world of difference. They have also some options on their own AAA team that could boost the lineup. I’ll cover that at a later date. Of course before any of this Bailey trade talk can come to fruition, he needs to come back and prove his health as well as show the kind of excellence we have seen from him in the past two years. If he doesn’t, the A’s won’t have as much leeway to trade bullpen arms for help in their lineup, but with Devine surging and a major league bullpen that has been one of the best in baseball so far, they don’t need Bailey to return to succeed. They are in a strong position either way, but obviously Bailey returning to greatness is the ideal scenario for them to maximize their time in the catbird seat. The prospect parade continued on Sunday as the Boston Red Sox announced they were calling up slick fielding shortstop Jose Iglesias to take the spot of Marco Scutaro, who is headed to the disabled list. This call up has exponentially less fanfare than that of Eric Hosmer for many reasons, chief among them being that he isn’t near the talent from a fantasy aspect and the fact that he’s essentially going to be a defensive replacement. The 52nd-ranked prospect by Baseball America is unquestionably excellent with the glove which has allowed him to climb the minor league ranks and reach AAA at the age of 21, but his bat lags way behind. It’s always going to, too. His ceiling is going to be a Rey Ordonez-plus. He likely won’t be quite as inept at the plate, but .700 OPS will be a challenge (Ordonez had a career .600 OPS). His lack of skill with the bat combined with his role as a defensive replacement make him a complete nonfactor in all fantasy formats. I have seen him drafted to minor league rosters in some AL-Only leagues and I’m not entirely sure why (and I’m talking long-term, not just ’11). Perhaps it is because he is the top rated or at least one of the top rated prospects on a high profile team, but those lists are all-encompassing meaning his remarkable defense matters. Unless you play a Strat-O-Matic or Scoresheet league, his defense means nothing for fantasy players. I was hoping that Yamaico Navarro would get a call soon even over Iglesias as he brings a lot more potential with the bat, but he suffered an oblique strain and on May 7th he hit the 7-day DL in the minors. That may be more why Boston went with Iglesias. Navarro had a strong season last year (hitting .275/.356/.437 in AA and AAA) crossing three levels including a 20-game stint with the Red Sox from late August through the end of the year. He was clearly overmatched in the small sample (.143/.174/.143), but that’s not too surprising for a 22-year old who had just 16 games of AAA experience prior to reaching the big leagues. He is back in Pawtucket and off to a great start this season hitting .329/.436/.612 in 101 plate appearances. He has 14 extra base hits including eight doubles, two triples and four home runs. He has driven in 12, scored 19 and two stolen bases. Perhaps as impressive as anything in his start is the 1:1 K/BB split (13 apiece). His plate patience has been something he seems to be working on constantly as he was sitting 2.4-2.5 in 2007 and 2008 before dropping to 2.0 in 2009 and then a really nice improvement to 1.3 last year. Primarily a shortstop in his minor league career, Navarro has also seen time at second base, third base and all three outfield spots this season. With that flexibility plus a great start at the dish, I wouldn’t be surprised if the Red Sox soon selected him to be their super-utility man especially in light of the fact that their backup outfielders, Mike Cameron and Darnell McDonald, are hitting a robust .158 combined (9-for-57). It will depend on how those two play in the coming weeks and how quickly Navarro heals from the oblique. But again even adding his 2011 start, he still has just 39 games above AA and he is still just 23 years old. I think Navarro is someone to strongly consider depending on league format. He may still be available in dynasty/ultra leagues, so check your wire. Meanwhile, AL-Only leaguers using a more limited minor league roster (3-7 slots) might want to make room to invest as he will almost certainly get the call before September, especially if he keeps raking the ball when he returns from injury. Don’t start releasing guys who are top 5-7 in their organization for him, but he is as good as any other lower rated org. guy… unless the org. is Kansas City. Yesterday and today have brought great news for two of the brightest minor league prospects in all of baseball as Kansas City Royals first baseman Eric Hosmer and Atlanta Braves starting pitcher Julio Teheran both learned that they are getting the call up to the show. Both were top 10 prospects on just about any list that you looked at this preseason and I had Teheran atop my list of National League pitching prospects back in March. The call ups are very different in terms of what they mean for fantasy owners both in the immediate future and going forward. Hosmer is chief among the coming wave of blue-chip talent for the Royals so him being the first to reach the majors amongst the hitters isn’t terribly surprising. He probably could’ve broken camp with the team, but they wanted to see what Kila Ka’aihue could do with a legitimate shot at every day at-bats. The Kila Monster raked his way through the minors including smashing 24 home runs in 94 games a season ago. And at 27, the organization owed it Ka’aihue and themselves to see if he was going to be a major contributor for what they hope is a winning ballclub in the near future. Or at the very least he could prove his worth at the major league level and then allow them to either flip him or Billy Butler for even more parts as those two plus Hosmer had the potential for a major logjam. Absurd is right. I understand gaming the system and keeping a guy down until late May or early June of a given year, especially if you don’t really have a shot to contend in a given year like KC this year, but keeping Hosmer down that long was just never going to happen. So Hosmer gets the call due not only to Ka’aihue’s failures but also his own excellence. He has punished AAA in his first tour of the league hitting .439 in 26 games along with 19 walks in 118 plate appearances giving him a .525 on-base percentage. He actually had more walks than strikeouts (16), something he also did in an 87-game sample in High-A at the start of last year. The power hasn’t been as prevalent as expected with just three home runs and five doubles in his 43 hits, but after posting a .233 ISO in his breakout season across two levels last year as a 20-year old, many believe it is simply a matter of when, not if in terms of his power production. ESPN’s Eric Karabell made a strong comp to that end likening him to Logan Morrison. Morrison showed power early on his career, but it tapered as he climbed the minor leagues though the batting average and on-base percentage remained elite. Morrison hit just two home runs in his 62-game debut last year and was pigeonholed at some outlets as a no-power, high-average asset despite being just 23 years old coming into this season. In his first 15 games he ripped four home runs while improving both his average and on-base percentage. Of course that is a tiny sample, but you can see where Karabell was headed. One aspect of Hosmer’s game many might not be aware of is the speed dynamic. He stole 14 bases a season ago and amassed nine triples. So while he may not deliver the punch right out of the gate (remember, he is all of 21 this year), he could offer some sneaky speed at the 1B or CI slot on your roster. And let’s not completely rule out the power, either. We are dealing with a whopping 26 games and if just two more balls had found their way over the wall, he’d be on a 31 home run pace over 162 games instead of the 18 we see now. He is undoubtedly already on a roster in any keeper league that has minor league rosters, but of course check just in case. He is probably rostered in most AL-Only leagues even if they are re-draft leagues as long as they have some kind of bench, but again, check. In leagues where he is available, he is an asset worth going heavily for just about regardless of format. The trickiest league for determining his value is the 10-team mixed league. With legitimately talent consistently on the wire throughout the season, you don’t want to get sucked in by the potential of the shiny new toy. Just remember what happened to Brandon Belt earlier this year (.569 OPS and demotion back to AAA in 17 G) and how underwhelming Freddie Freeman has been thus far (.700 OPS in 32 G). Hosmer rates higher than both on virtually all prospect lists, but that doesn’t mean he couldn’t end up performing quite similarly. Rostering him in a 10-team mixer depends entirely on who you would be cutting to get him. If you want to run your scenario by me, feel free to do so in the comments below or on Twitter (@sporer). If it’s a luxury spot for you and you want to see if the lottery ticket hits, go for it. If you’re cutting a contributing member of your team to take a shot on him, consider the potential downside, too, instead of just dreaming of what might happen. Also, I would raise my bid substantially in OBP leagues. The Braves calling up their top pitching prospect was a bit more unexpected than Hosmer, but once the confetti settled and everyone read the fine print, the excitement was tempered after learning Teheran would only be up for a start on Saturday against Philadelphia because of a doubleheader before heading back to the minors. As such, he should be treated as any other spot starter that you would use from the Trolling the Wire pieces I post here. If you have been streaming starters this year, then I would consider him just ahead of Tom Gorzelanny, who is one of my recommendations for Saturday. He isn’t without risk, but the Philly lineup is hardly daunting. Teheran, younger than Hosmer at just 20 years old, has a 1.80 ERA and 1.10 WHIP in 30 innings at AAA-Gwinnett going 3-0 in his five starts. His 3.1 K/BB ratio is strong, but down significantly from his previous marks thanks to a 7.5 K/9 which is 2.5 off of last year’s pace. In sort of an odd pattern, he has done this before, though I’m not sure how much stock I would put into it. In his 15-inning debut back in 2008, he struck out 10.2 per game. He followed that up with 7.4 per game in 81 innings as an 18-year old in 2009. Then he ramped it back up to an even 10 last year in his best season yet which totaled 143 innings. It could just be him getting used to the tougher competition, too. Every promotion except the one from A-ball to High-A sees a drop in K/9, but when he repeated A-ball from 2009 to 2010, the strikeout rate climbed back up to an elite level. In other words, as he gets used to a competition set, he adds the strikeout back into his arsenal as the premier way of getting outs. These are all tiny samples, but the biggest simple sample is the High-A one which is nearly twice as long as most any other one and we see that he also put up his best strikeout rate there. It would be more helpful to see splits from that stint to see if there is anything to this notion, but my general inclination is to not worry about the lower strikeout rate at the outset of his AAA career as I believe it will rise over the summer. I wouldn’t read anything into why he is being brought up instead of, say, Mike Minor, either. Minor pitched yesterday (May 5th) and pitched quite brilliantly mind you as he has all year so far, while Teheran hasn’t pitched since April 30th. This allows them to build in a longer break for their 20-year old elite prospect as they find ways to limit his workload as well as give him a taste of the majors and perhaps learn something about just how close he is to sticking at the big league level. Do not cut anyone of value to pick up Teheran in your league. He should be a daily-league only play for those who are spot starting. He will be back down to the minors after the start regardless of how well it goes. The Braves have their five starters and if they need one on a long-term basis, it’s going to be Minor. Just enjoy Teheran’s sip of coffee and hope that we get to see some of the excellence that is expected from this youngster in the years to come. But if he’s pounded and lasts just four innings, don’t panic. It means nothing.